Best/worst cricketing experience: Best - Winning ACST HK Cricket Festival Cup 2010. Winning ACST HK Cricket Festival Plate 2012. Sri Lanka CC first ever win against Vagabonds who scored 202, being 7/88 and being in a 89 runs partnership to steer us to victory at 9/203. 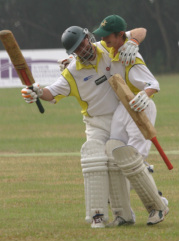 Centaurs scoring 109 and beating HKCC Nomads by 5 runs after they were 9/54. Batsman Caught B. McDonald, Bowled R. McDonald. Every game of cricket with my son. Listening to Andy Scott's sledging of the opposition. My first game with Lamma C.C. Worst - Being asked to leave the ground with a fake injury by the Captain Vagabonds after 30 overs. Being knocked out after catching Damien Kelleher at Mission Road.